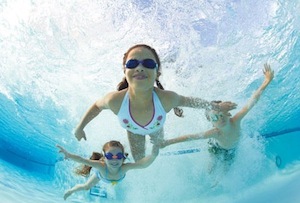 Learning to swim underwater is a really big deal for kids. Another really big deal is seeing who can stay underwater the longest. Breath-holding contests seem like an innocent enough rite of passage but some high-profile drownings by expert swimmers in recent years have illustrated the dangers involved with holding one’s breath too long underwater. In May, a man drowned in a New Jersey swimming pool; he had been a diver for the Australian Navy and was practicing breath-holding techniques. In April, two US Navy SEALS drowned in a shallow pool in Virginia while doing similar breath-holding exercises. Also in April, a 25-year-old man said to be a recreational diver and spear-fisherman from Atlanta drowned in his family swimming pool while doing breath-holding exercises. All these men were in shallow water, in the prime of life, enjoyed excellent health, and considered expert swimmers. Their deaths and others like them led the New York City Department of Health and Mental Hygiene to conduct a joint review of drowning incidents with the New York State Department of Health. Drownings are usually documented by outcome: fatal or non-fatal. The NY study focused instead on “contributing behaviors” in 16 drownings reported to the state between 1988 and 2011; four of them were fatal. Of particular concern to the study team were “dangerous underwater breath-holding behaviors,” or DUBBs. Some of the drownings were the result of shallow-water blackouts experienced by swimmers in training to improve fitness, qualify for military duty, or to expand lung capacity for whatever reason. One-third of them occurred during breath-holding games or competitions among recreational swimmers. Fifteen occurred at swimming pools with on-duty lifeguards who attempted rescue. More than half the drownings occurred when the victim was swimming with companions. To stay underwater longer, many people will forcefully expel their breath before submerging (deliberate hyperventilation), with the expectation that empty lungs will hold more fresh air and allow more time underwater. Once oxygen supply is depleted, a build-up of carbon dioxide signals the body to breathe again, theoretically forcing the swimmer to surface. Hyperventilation can work differently than expected, however. When the swimmer expels enough carbon-dioxide-rich air before submerging, the body’s remaining carbon dioxide levels can be very low. Even when oxygen is depleted, the resulting accumulation of carbon dioxide may not be enough to trigger the surface response. The swimmer will instead go unconscious, making it impossible to resurface or signal the need for help. Once unconscious, the body breathes reflexively, filling the lungs with water, not air, and death occurs quickly without immediate intervention. When an underwater blackout occurs, the swimmer cannot fight back. There are no thrashings or other obvious attempts to save themselves. Lifeguards and companion swimmers may never be aware of the danger going on under the water’s surface. “It’s very quiet, so it’s very difficult to detect,” said Dr. Rhonda Milner, the mother of Whitner Milner, the 25-year-old Atlanta diver who died in the family pool. Her son’s death led Milner to found the Shallow Water Blackout Prevention Program. The organization’s website includes videos featuring Michael Phelps, the Olympic swimming champion, and Dr. Sanjay Gupta from CNN. In New York, a statewide campaign has been launched to promote public awareness of the dangers of DUBBs at pools and other bathing facilities. In addition to signage appropriate for swimmers of all ages, educational programs directed at swimmers, parents, swim coaches, owners and operators of swimming facilities, and public health officials have been implemented. Boyd, Christopher, et al. "Fatal and Nonfatal Drowning Outcomes Related to Dangerous Underwater Breath-Holding Behaviors — New York State, 1988–2011." CDC Morbidity and Mortality Weekly Report (MMWR). Centers for Disease Control and Prevention (CDC), May 2015. Web. 16 June 2015. Shallow Water Blackout Prevention. N.d. Web. 16 June 2015. Chen, Angus. "Breath-Holding In The Pool Can Spark Sudden Blackouts And Death." NPR / Shots. NPR, 29 May 2015. Web. 16 June 2015. Next: Does Eating Your Placenta Have Any Real Health Benefit?